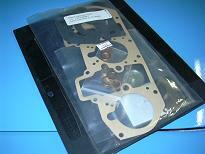 This Kit will provide the parts to rebuild Two, Triple throat Weber Carburetors typically used on the Porsche 911. These kits are the best around with all the parts that need to be renewed. You will receive numerous gaskets, washers, o-rings and spacers, fuel inlet needle valves, accelerator pump diaphragms, etc.